Sarah Crichton Books, 9780374171995, 290pp. Nairobi, 2007. In Africa’s sprawling megacity, a small elite holds power over an impoverished, restless majority. Corruption, exploitation, and ethnic rivalry are part of everyday life. Amid claims of vote rigging and fraud, the presidential elections could be the spark that sets this city ablaze. With chaos looming, few care about one dead prostitute. But Detective Mollel does. For Mollel is a former Maasai warrior, and the dead girl was a Maasai, too. As he ventures from slums to skyscrapers, from suburbs to sewers, Mollel begins to realize that there is more at stake than just this murder. But even as he is forced to confront his turbulent past, he begins to doubt his warrior’s instincts. Can Mollel manage to find the killer and solve the case before the Red God consumes all? 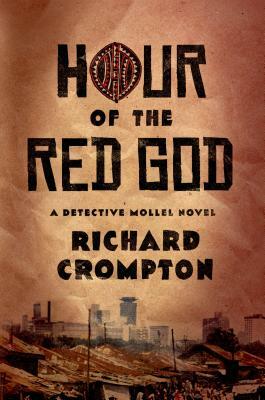 With the sophistication of Ian Rankin and Colin Harrison, and set against the backdrop of Kenya’s turbulent 2007 elections, Richard Crompton’s Hour of the Red God brings Nairobi vividly to life: gritty and modern, with an extraordinary blend of tribal and urban elements. In this dark thriller, tradition and power collide, arriving at a shocking, unforgettable end. And in the Maasai hero Mollel, a new detective icon is born. Richard Crompton, a former BBC journalist, lives in Nairobi, Kenya, with his wife and their three young children. Hour of the Red God is his first novel.